Beautiful certificate from the Marchant Calculating Machine Company incorporated in 1913. This historic document was printed by the Union Litho. Company and has an ornate border around it with a vignette of a hand cranked cash register. This item has the hand signed signatures of the Company’s President,Rodney Marchant and Secretary, Alfred Marchant and is over 96 years old. 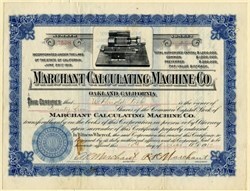 The Marchant Calculating Machine Co. was founded in 1911 by Rodney and Alfred Marchant in Oakland, California. The company first built mechanical, and later electromechanical calculators which had a reputation for their reliability. 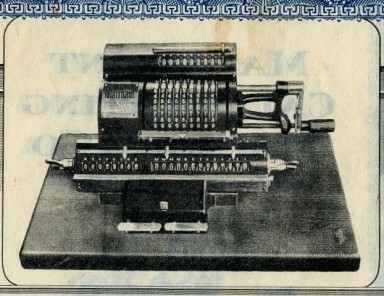 In 1958 the company was acquired by the Smith Corona typewriter company in a diversification move that proved unsound; the company which was now known as SCM, tried to stay competitive by introducing the SCM Cogito 240SR electronic calculator (designed by Manhattan Project veteran Stan Frankel) in 1965. Within a few years a tidal wave of cheaper electronic calculators had devastated their business, and by the mid 1980s, SCM's typewriter business, too, had been ruined by advent of inexpensive personal computers used as word processors.